At the 2007 GreenBuild Conference the USGBC released the results of their first major study of energy consumption by LEED-certified buildings. Then they presented conclusions from the now infamous study conducted by the New Buildings Institute (paid for by the USGBC and EPA) which, based on data “volunteered by willing building owners” for only 22% of the eligible buildings certified under LEED NC v.2, concluded that LEED certified buildings, on average, were demonstrating the anticipated 25-30% savings in (site) energy. NBI looked only at building energy used on site (i.e., site EUI) rather than on- and off-site energy use (i.e., source EUI). To NBI’s credit they made their summary data available to others for independent analysis with no “strings attached.” In the end even the data gathered by NBI, skewed towards the “better performing” LEED buildings by the method for gathering data, when properly analyzed demonstrated no source energy savings by LEED buildings. LEED office buildings demonstrated site energy savings of 15-17% — about half that claimed by NBI, the difference being associated with NBI’s improper averaging method. This site energy savings did not translate into a source energy savings because LEED buildings, on average, used relatively more electric energy, and the off-site losses associated with this increased electric use wiped out the on-site energy savings. The lack of representative building energy data was addressed in LEED v.3 (2009) by instituting a requirement that all LEED certified buildings supply the USGBC with annual energy consumption data for five years following certification. Never again would the USGBC have to publish conclusions based on data volunteered by 1 in 5 buildings. Expectations were high. But what has this produced? The USGBC has learned from their experience with NBI — not to hand over such an important task to an outside organization because you can’t control the outcome. NBI’s analysis was scientifically flawed — but it was transparent, and such transparency gave critics ammunition to reach different conclusions. Nowadays the USGBC simply issues carefully packaged sound bites without supplying any details to support their conclusions. There isn’t even a pretense of conducting scientifically valid analysis. the average ENERGY STAR score for these 404 buildings was 85. Next, consider the “un-weighted” source EUI figure for the 450 buildings. This is a useless metric. All EUI reported by CBECS for sets of buildings are “gross energy intensities” equivalent to the gsf-weighted mean EUI (not the un-weighted or building-weighted mean EUI). This was a major source of error in the 2008 NBI report — leading NBI to incorrectly calculate a 25-30% site energy savings rather than the actual 15-17% site energy savings achieved by that set of LEED buildings. Consider the assertion that the 158 kBtu/sf source EUI figure is 31% lower than the median source EUI (presumably for all US commercial buildings). To be correct this would require the median source EUI for all US commercial buildings be 229 kBtu/sf. This is rubbish. The best way to obtain such a median EUI figure is from the 2003 CBECS data. The Energy Information Administration (EIA) does not report source energy figures in any of its CBECS reports. But the EIA does report site and primary electric energy used by buildings, and these may be combined to calculate source EUI for all 2003 CBECS sampled buildings. This results in a median source EUI for the estimated 4.9 million commercial buildings to be 118 kBtu/sf. If you instead restrict this calculation to all buildings with non-zero energy consumption you find these estimated 4.6 million buildings have a median source EUI of 127 kBtu/sf — way below the 229 kBtu/sf figure asserted by the USGBC. This USGBC claim is patently false. Of course the USGBC may be referring to the median source EUI of some unspecified subset of U.S. buildings. By choosing an arbitrary subset you can justify any claim. And if you don’t specify the subset — well, the claim is nothing more than noise. What about the average ENERGY STAR score of 85? Is this impressive? The answer is no. Even if you believed that ENERGY STAR scores were, themselves, meaningful, such an average would still mean nothing. 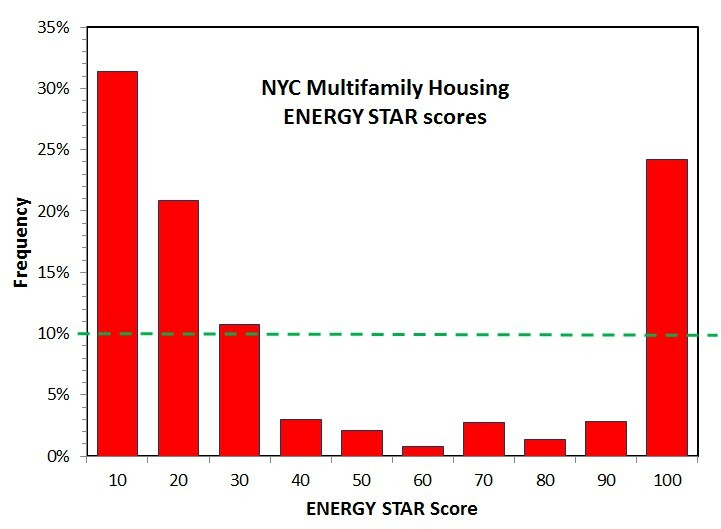 ENERGY STAR scores are supposed to represent percentile rankings in the U.S. building population. Since there are 4.8 million buildings, by definition we would expect 10% of these (or 480,000) to rank in the top 10% and we would expect another 480,000 of these to rank in the bottom 10%. That means that if 1,861 buildings are chosen at random from the building population, we expect 10% of these to have ENERGY STAR scores from 91-100. Similarly, we expect 30% of these (or 558) to have ENERGY STAR scores ranging from 71-100. Guess what — the average ENERGY STAR scores of these 558 buildings is expected to be 85. Only those who are mathematically challenged should be impressed that the USGBC has found 404 buildings in its set of 1,861 that have an average ENERGY STAR score of 85. If you cherry pick your data you can demonstrate any conclusion you like. And, of course, these 1,861 buildings are not chosen at random — they represent buildings whose owners have a demonstrated interest in energy efficiency apart from LEED. I would guess that the vast majority of the 404 buildings were certified under the EBOM program and have used Portfolio Manager to benchmark their buildings long before they ever registered for LEED. LEED certification is just another trophy to be added to their portfolio. No doubt their ENERGY STAR scores in previous years were much higher than 50 already. What was the value added by LEED? I openly offer my services to analyze the USGBC energy data in an unbiased way to accurately asses the collective site and source energy savings by these LEED buildings. How about it Brendan Owens (VP of technical development for USGBC) — do you have enough confidence in your data to take the challenge? Which is more important to you, protecting the LEED brand or scientific truth? a set of voluntary partnerships between the U.S. government and product manufacturers, local utilities, home builders, retailers, and businesses. These partnerships are designed to encourage energy efficiency in products, appliances, homes, offices, and other buildings. This was the basis for the EPA’s building ENERGY STAR scoring system. It was a “game” that building managers voluntarily agreed to play with rules (methodology for scoring buildings) set by the EPA in consultation with those playing the game. There was no scientific vetting of the “rules of the game” — nor did there need to be — it was just a game designed to “encourage energy efficiency.” No one was forced to play the game. Data submitted to Portfolio Manager (the EPA’s web-based tool for calculating scores) and ENERGY STAR scores issued by the EPA were confidential — unless a building sought and received ENERGY STAR certification. Participation was entirely voluntary. Building managers disappointed with their ENERGY STAR scores could just walk away from the game — no harm, no foul. But this has all changed. In recent years 1) the EPA has published specific claims regarding energy savings associated with its ENERGY STAR benchmarking program (real savings not just fantasy football), 2) external organizations like the USGBC have adopted the ENERGY STAR score as their metric for energy efficiency in green building certification programs and are using these scores to make energy savings claims of their own, and 3) major U.S. cities have passed laws requiring commercial building owners to use Portfolio Manager to benchmark their buildings and, in many cases, the resulting ENERGY STAR scores are being made public. With federal, state, and local governments requiring LEED certification for public buildings this is no longer a voluntary game — it is mandatory and real (testable) energy claims are being made based upon ENERGY STAR scores. Now the science behind such claims actually matters — and this science has never been vetted. Its kinda like a small, “mom and pop” operation that has been selling chicken soup using “grandma’s recipe” without obtaining proper license or FDA approval. Now imagine Walmart decides to market and sell the soup — the scrutiny changes. As a voluntary game with no connection to reality it is OK that the EPA negotiates rules for its ENERGY STAR ratings with different constituents — like allowing Washington DC office buildings to ignore their “first floors” in seeking ENERGY STAR certification. After all, who am I to interfere in the activities between consenting adults when these activities do not affect me? But for ENERGY STAR — these days are gone. In the next year we will learn much about the science that underpins the EPA’s ENERGY STAR benchmarking system — and the results are likely to be very disappointing. This benchmarking system is not ready for prime time. The US Environmental Protection Agency (EPA) issues ENERGY STAR building ratings for 11 different kinds of commercial buildings. The so-called Technical Methodology for each of these building ratings is described in documents posted on the EPA web site. Presumably anyone can work through the details of these technical documents to duplicate the EPA’s methodology. But this is not the case for one of the models — that for Medical Office buildings. If you follow the instructions set forth in the EPA’s document for extracting the building records from the 1999 CBECS on which this model is based you do not obtain the list of 82 buildings the EPA claims are the basis for this model. Instead you obtain a list of 71 buildings. Furthermore, if you calculate the mean properties of this set of 71 buildings you do not obtain those published by the EPA for this building set. And finally, if you perform the regression the EPA says it has applied to these buildings you obtain different results than those published by the EPA. In short, it is clear that the EPA’s Technical Methodology document for Medical Offices does not correctly describe their model. I have petitioned the EPA through the Freedom of Information Act to supply the list of CBECS 1999 building ID’s that are used this model (EPA-HQ-2013-009270). The EPA has responded that it does not have this list. This means that the EPA not only has incorrectly described its own Medical Office model — it does not even know what the basis for this model is! Its document describing the Technical Methodology for this model is fiction — just like the ENERGY STAR scores the EPA hands out for Medical Office buildings.